Famed console modder Edward Zarick, who brought us the "Xbook" and "Playbook" devices has just revolutionized the world of third-party gaming hardware in his latest release. 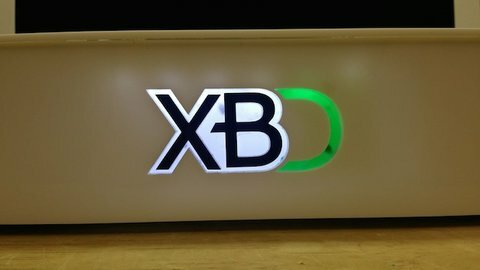 Dubbed the "Xbook Duo", this amazing devices combines the functionalities of both the Xbox One and the Xbox 360 into one compact package that is able to play games made for both of the aforementioned consoles. His creation is the first of its kind, and is able to transition between the two consoles at the flip of a switch. Below is a video made by Zarick that demonstrates the Xbook Duo's key features. Though the devices is able to play games from both consoles, it is not true backwards compatibility just yet. You must still switch controllers if you want to play a game for a different console, which is rather tedious. 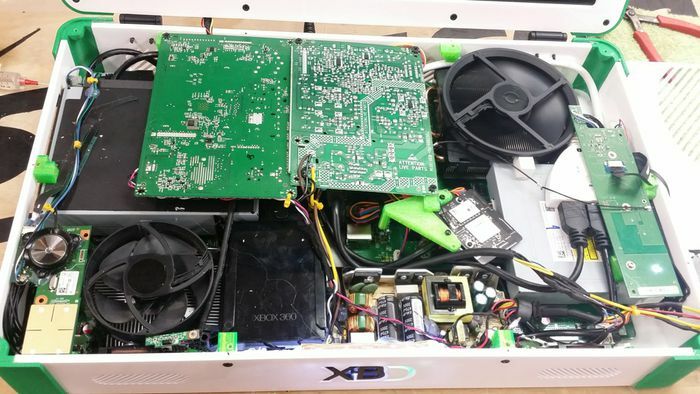 It has a disc tray for Xbox One games on the right, and a tray for Xbox 360 games on the left, as shown below. The device comes in one compact package, and Zarick asserts that though the hardware is packed into a small space, he has conducted extensive testing on the device to prevent overheating. On the device is a 22" Vizio Monitor for mobility and on-the-go gaming. You may be wondering: how may I procure such a wonderful device? Unfortunately, due to the fact that this device is still a rough prototype and meant for demonstrative purposes, is not on the market as of yet. We console gamers may only gaze at the glory of a device that is so close, yet so far from our possession. However, if you are experienced with computer hardware and DIY projects, he has posted various articles on his website including several rough videos containing instructions to build this device. Though this is not a mass-produced consumer product, it does set the stage for further devices with similar characteristics. This device has set a standard for third-party console devices, and has strayed far outside the norm for console modding. Hopefully this development spurs further third-party console mod development, and even urges Microsoft to integrate backwards compatibility into its devices in the future, as this is obviously a feature that is desired by the end-users. Zarick offers Xbook and Playbook devices already on his website, albeit at exorbitant prices: would you consider purchasing such a devices for upwards of $1,500 if it were to be released to the public? How do you feel about this new development for console gaming?